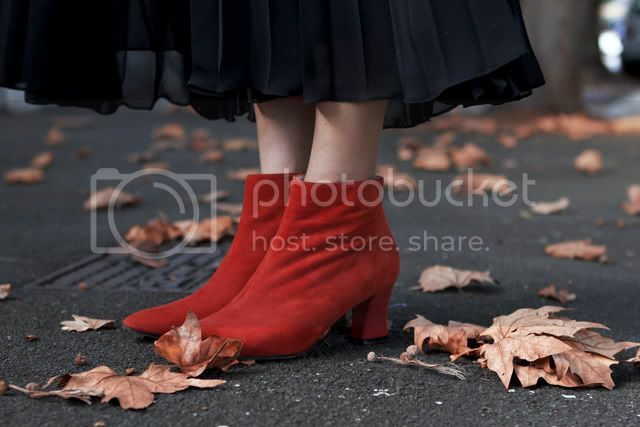 Gary Pepper Vintage: R O B E R T .
R O B E R T .
Currently in love with these bright orange vintage suede boots by Robert Clergerie. I've been trying to find a pair of suede ankle boots but haven't been able to justify spending the money on the ones I've seen in Country Road or Zimmerman. Oddly enough I've had these in store for nearly three months, and after no one purchasing them I decided to keep them for myself. Absolutely amazing on and made from a beautiful Italian leather, sometimes some things are just too good to pass up. Unfortunately I decided to wear them out on Friday night when it started pouring down with rain, so I am hoping the guy at the shoe repairs is actually some sort of wizard and can save what's left of them after being drenched in water and covered in Sydney grime. Funny thing is it's going to cost me twice as much to have them resoled and cleaned than the price I paid for them in the first place. The downfall of owning something so beautiful yet irreplaceable. Fingers crossed they come out alive! I love this :) As usual,love your blog & everything. These colours... just amazing. I love Alexander wang. this is gorgeous! i love your skirt and bag. and maybe i love everything else too. Pleated maxi skirt <3 So jel! And fall foliage to go with the beautiful knit and sheer layers of the pleated skirt! Perfect! Love your outfit, as usual! the red hat is perfect! I hope those beautiful boots can be restored, they are a gorgeous color and make a wonderful pair with your hat. And the collar on your jumper is so darling! love your skirt & hat ! I really like the skirt. Beautiful look! These boots look lovely on you. Hope they come out alive and well. Oh well but the shoes are in such a beautiful color and it matches your hat too well :) It's worth it! You look stunning! I really love the effortlessness of this outfit. Gorg. those boots look very luxurious! i want that sweater! check out my blog and etsy! Great outfit. I hope your boots end up okay. I always end up getting my suede shoes wet. i love the black and white in the middle of the colored hat and boots. you are a fashion queen! i love it..its perfect and you look beautiful as always. Oh no! I hope they are able to be fixed! I am afraid of suede shoes for that exact reason! And I hardly ever wear my most loved shoes! But they are beautiful to look at! Sigh. I love this! Great outfit! I bet people want to buy them now that you've styled them so perfectly with this outfit! Beautiful coloured suede and a well crafted boot. Loving rouge all over, every season, all the time!!! Gorgeous outfit!!!! The skirt is so beautiful!!! I love the way the hat and the shoes match! You look great! I love your skirt! It is such a great length. loving your cute little bo beep sweater! and the rust coloured suede booties are just fabulous!